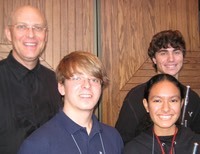 Congratulations to students who performed at the National Flute Association Convention held this summer in Orlando. 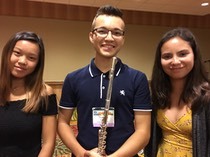 From left, Jacqueline Kao (Olympia High), Thomas Molano and Alexa Perez (Osceola County School for the Arts) performed on the Repertoire Gems Concert. Here are some student accomplishments. Jake Chabot and Tim Carey. Back row: Dr. Richard Clary, conductor; Jake Chabot, piccolo; Front row: Principal flute Jacqueline Vilca and Principal Second flute Jacob Virkler. 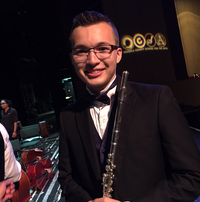 Congratulations to Thomas Molano, who as a concerto competition finalist, performed Mozart’s G Major concerto with Osceola County School for the Arts orchestra. Congratulations to Jake Chabot, who has won a position with the Louisville Symphony. Jake completed his undergraduate and graduate degrees at the Juilliard School. Congratulations to Eugenia Akins, Miss Gainesville, who played flute as her talent while competing in the Miss Florida Pageant. Eugenia is a graduate of Osceola County School for the Arts and the University of Florida. Congratulations to Jacqueline Vilca (music therapy) and Jasmine Vilca (music education) who graduated at the top of their class at the University of Miami. Jacqueline Vilca has completed her internship at Columbia University in New York City in music therapy and has accepted a position in Chicago. Jasmine Vilca is teaching at a Central Florida private school. Congratulations to Mackenzie Miller, who is pursuing her Bachelor of Music degree at the University of Miami, for receiving a Disney Scholars award, as well as two UM scholarships for both music and academics. Mackenzie received a tuition scholarship from Sir James Galway to attend his summer masterclass in Switzerland. 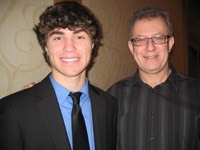 Jake Chabot was 1st place winner of the 2011 Florida Flute Association's High School Young Artist Competition. Jake performed the Poulenc Sonata with English pianist Tim Carey. Jake also received a full scholarship to Interlochen Arts Camp for the summer of 2011. Also, congratulations to Jacqueline and Jasmine Vilca for performing in the Florida Flute Association 11/12 Masterclass Competition and performing with the Honors Band of America in Indianapolis. Below, Jake Chabot performs the Nielsen Flute Concerto with the Florida Symphony Youth Orchestra during his senior year of high school.